Monday is Valentine's Day. If you haven't given it a thought, there's still time to get festive. Check out these completely awesome cup wrappers from Eat Drink Chic. Spotted at Creature Comforts: a link to Valentine e-cards at Kate Spade. Choose from approximately one zillion different designs. Get a PDF with four different printable Valentine cards, compliments of Fellow Creatives. And if you're simply not an effusive, sentimental sap like the rest of us, download the valentine schmalentine from Mmmcrafts. cute, cute, cute! Off to print these gorgeous printables. "You'll do." Ha! That's so me. Love it. I happen to love Valentine's Day, but I know a few people who will love that "You'll do" card! Hey, Jessica, thanks for linking. Love those cup wrappers! Although I don't really "know" you, I like to follow your blog, and when I saw this in the Wall Street Journal, I thought of you! Well, not really, but you're good enough for now." 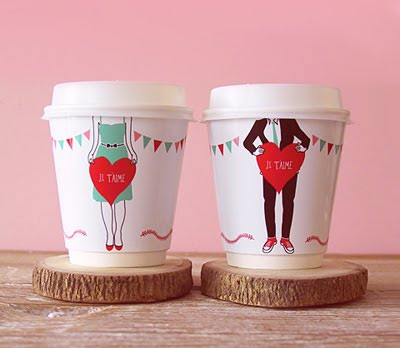 Oh the coffee cups - I MUST get my hands on these! So cute! Love your printable collections. You find the greatest thing. Every time i need a card I search your archives, and these don't disappoint! We got a BIG giggle out of the second "You'll Do" card! Thanks so much for sharing -- and for the laugh! Hey, thanks for the article, Tingaling! Hi! I just wanted to share that I reposted your list of printables...I think it is wonderful! I heart your blog and thank you for always bringing such brilliant ideas. Cute ideas! "you'll do"...that's hilarious!